Weathermen are the only people on the planet who can be wrong every single day of their life and still have people hanging on their every word. During my last night in Seoul, I learned that Korean weathermen are no different than American weatherman- their forecasts are meaningless. For my trip to the DMZ earlier in the day, the weather forecast called for an 80 percent chance of driving winds and rain. Luckily for my friend and I there was nothing more than drizzle and some low-lying, eerie, clouds. That evening promised to be clear and cool, but we would have no such luck this February night in Seoul. As we walked out of the hotel with our polka-dotted umbrellas, unexpected raindrops fell and peppered our shoulders. Mother Nature wanted to rain on our parade through Seoul, but we would not allow it. Tonight’s sudden rain rain mixed with Myeongdong’s bustling streets and provided a window into how the city shifts gears from dry to wet in a matter of moments. There were also some great photographic opportunities. Myeongdong’s side streets turned into glistening gates into the city’s heart. Umbrellas filled the streets and shielded shoppers from the unexpected evening showers. Hoards of shoppers, locals, and tourists alike flowed effortlessly through the narrow streets much like the way the ocean shifts around barriers as the tide comes in and out. Shopkeepers and stands became obstacles to the crowd, but they were not barriers. Passersby listened to shopkeepers peddling their products and continued into the bright Myeongdong night. Somehow even this woman maintained some sort of order in front of her store. As the masses crammed into narrow alleys and pranced down the glistening Myeongdong streets through this rain shower, other characters of the night also emerged. A woman accosted foreign tourists into her massage parlor. A man tried to sell us selfie sticks for our cell phones, but a cool cat was also on the prowl. A local cat cafe mascot was wandering the streets, looking for customers. Much like his feline cousins, he wanted nothing to do with the rain. And then it was over. As quickly as the rain started, it tapered off and stopped. Bustling life in Myeongdong returned to normal and the memories of glistening Myeongdong were gone as quickly as they started. Every dog, and cat, as the adage goes, has his day. As the rain stopped, he could return to normal work. With each passing hour and new experience in Seoul, the city’s mystique and charm grows on me. As readers here know, I fell in love with Seoul many months ago, but its alluring ambiance is quickly making it as appealing as Tokyo for me. You never know what you will see or get on any given night in one of the busiest parts of one of the world’s most bustling metropolises. 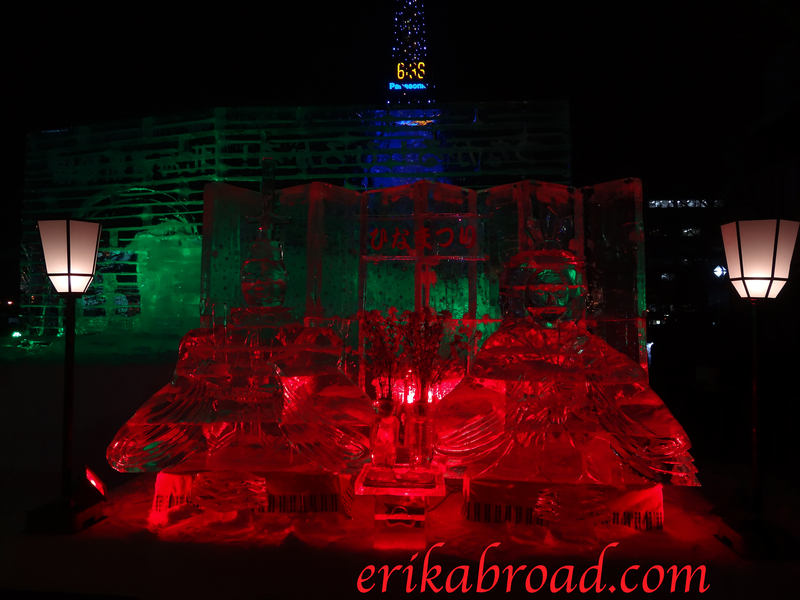 The first evening in Sapporo was very memorable as my friend and I had our first glimpse into Sapporo cuisine while also sampling some of the local specialty Sapporo beers and checking out the ice sculptures at the Susukino ice sculpture site very near our hotel. 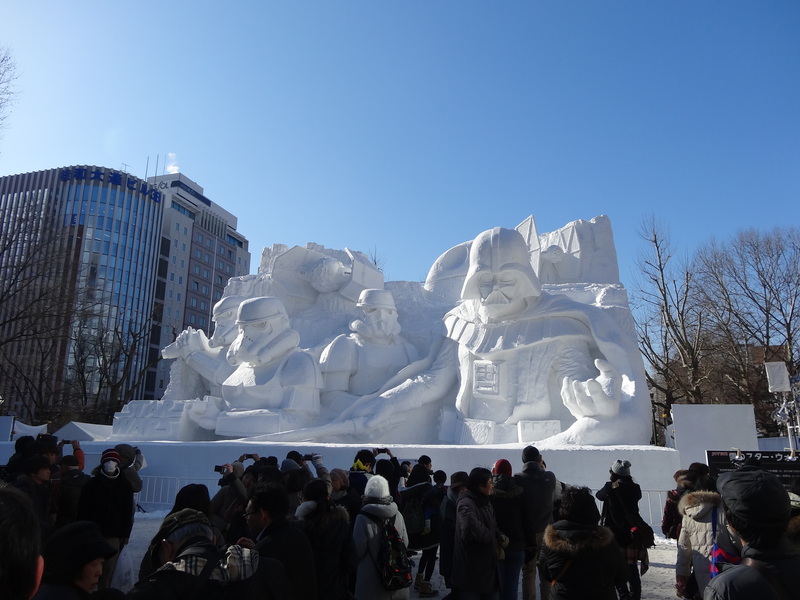 Our second day in Sapporo was a much longer affair filled with more sightseeing and encounters with spectacular snow sculptures at the main Odori Park staging grounds. When it comes to booking hotels when I am on vacation, it is all about location, location, location. The capsule hotel for the Snow Festival did not disappoint. We were equidistant between both of these sites and within eyeshot of one of my favorite components of the snow festival: the freestyle snowboard and ski ramps. 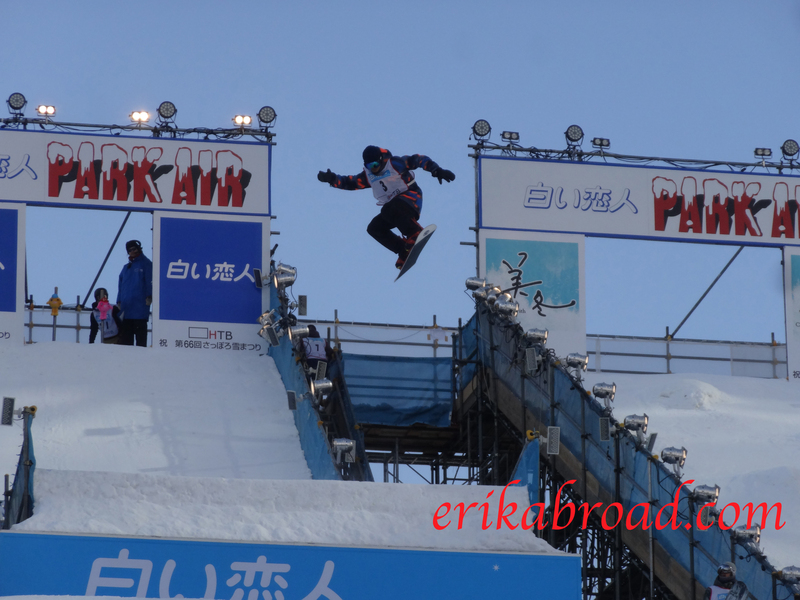 I certainly expected to see many elegant snow sculptures in Sapporo, but not ski jumpers showing off their aerial skills each morning, afternoon, and night. My friend and I trekked over to the ramp to watch a few rounds of jumps before moving onward. 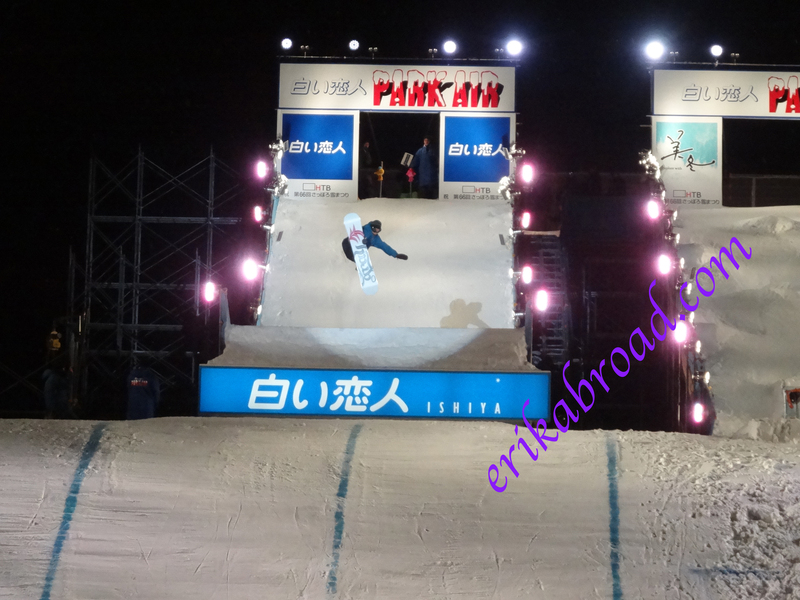 It was my first time watching snowboarding like this in person and it was very impressive. The snowboarders during the morning session got some serious air as American rock music and some sort of Russian electronic music played in the background. It was certainly an interesting sight to behold. 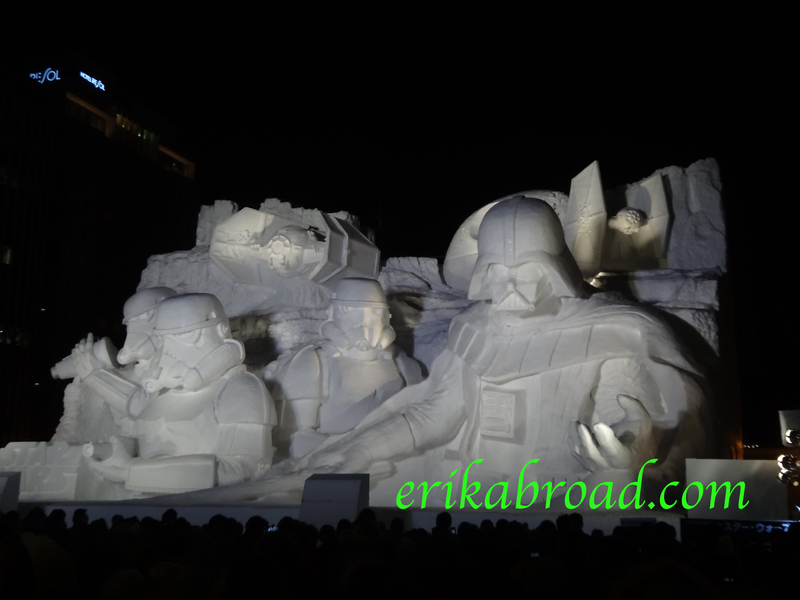 After watching this for almost an hour, we headed off, through Odori Park to take in the most spectacular snow sculptures I have ever seen. First up for the morning was this stunning Star Wars sculpture. Even if the Sith theme song was not playing in the background, you could hear Darth Vader’s voice, the lasers firing out the Tie Fighters, and even the humming of a lighsaber as you walked past this masterpiece. The details on all of the figures were so intricate. Everything from grooves on the Death Star to the visors on the Storm Troopers was taken into account for this one. In all honesty, a photo does not give this sculpture justice. Further down the street past an assortment of food stalls and smaller sculptures, the Manila Cathedral stood. I had heard through some posts on twitter that the cathedral was here, but I was not expecting to see a sculpture as large, detailed and beautiful as this one. I was taken back to my time in Manila back in October by this beauty. All that was missing were the fountains, the statue of King Phillip, and a few palm trees. There were even salmon waiting for us at this juncture in the trip. 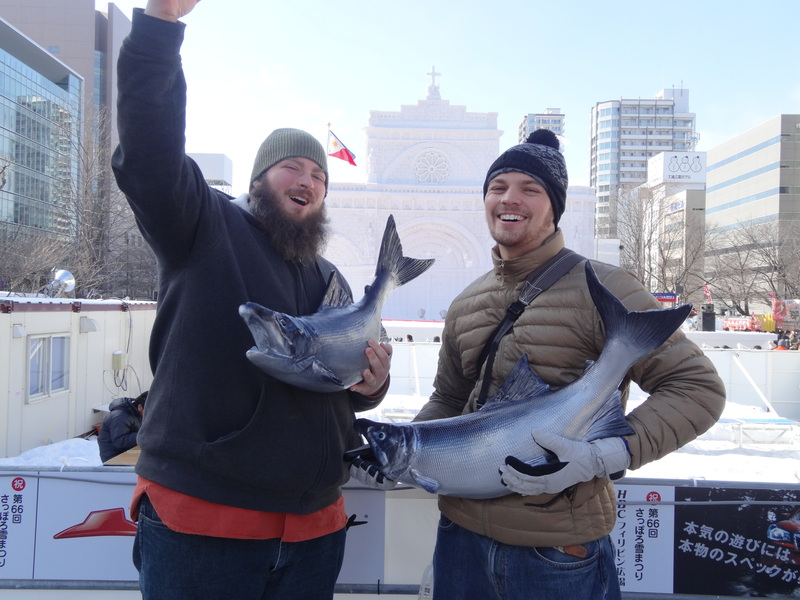 From there, we continued onward passing more, smaller, sculptures and the international submissions to the sculpture competition going on at the far end of Odori Park. We turned around and headed back towards the Television Tower to see if anything else was happening at the snowboarding area and to grab some lunch. 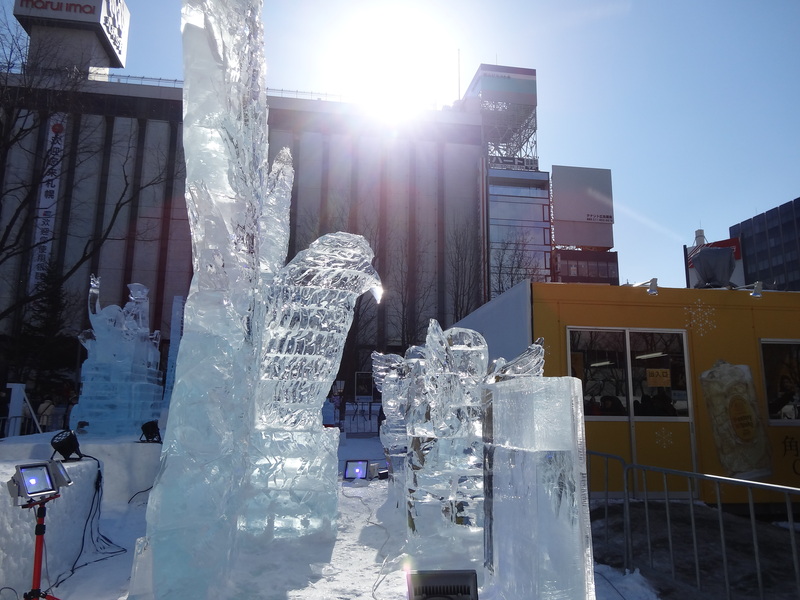 A few very nice ice sculptures were waiting for us. 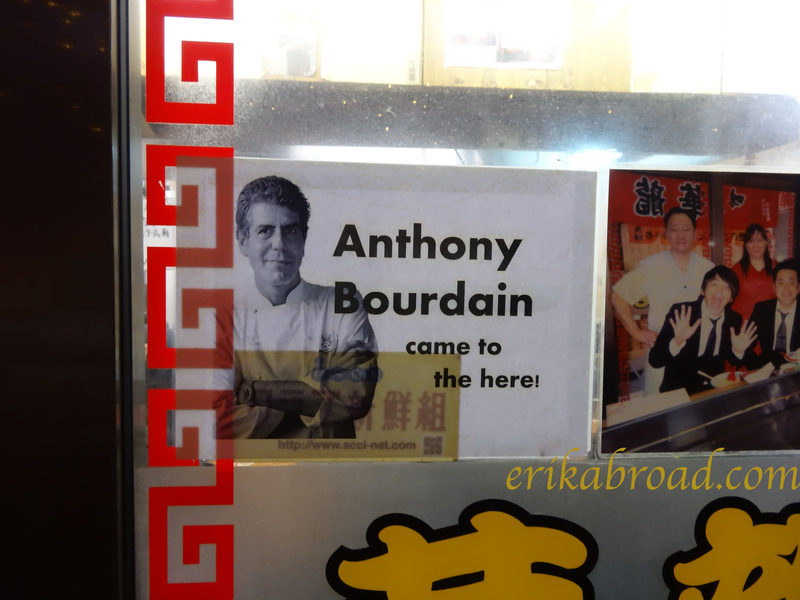 As night began to fall, we quickly headed off for some more of Sapporo’s famous miso ramen and decided to go to a place where “Anthony Bordain had come to the here.” For some reason, we thought this would be the best establishment at Ramen Alley, but we were mistaken. I still took a photo of the sign, for good measure. With our guts filled with some savory ramen and Sapporo beer, we walked back to Odori Park to see the sculptures in all of their nighttime splendor. All of this took place on beaten, worn, and treacherous snow-covered sidewalks. My friend and I slipped and fell countless times throughout the weekend. 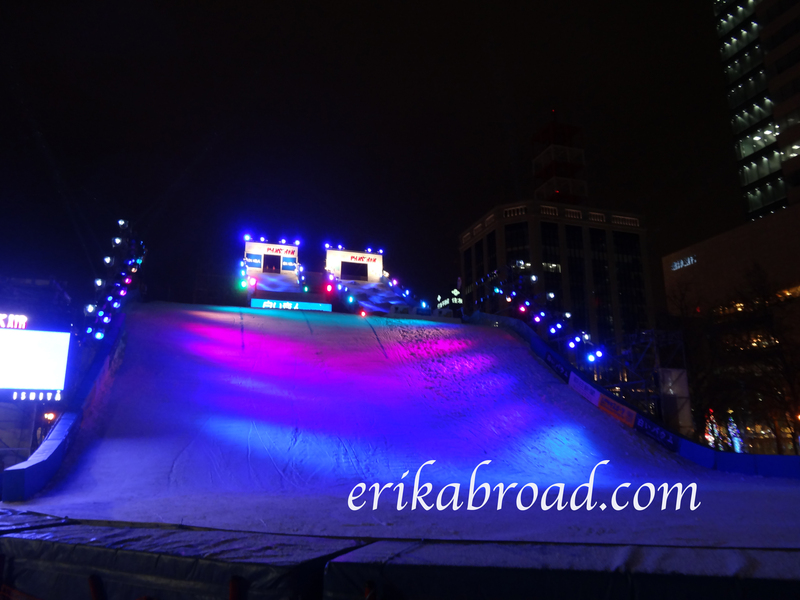 After a ten minute walk, we were back at the snow park and watched some great nighttime snowboarding. Believe it or not, children as young as nine and ten years old were jumping off this ramp! 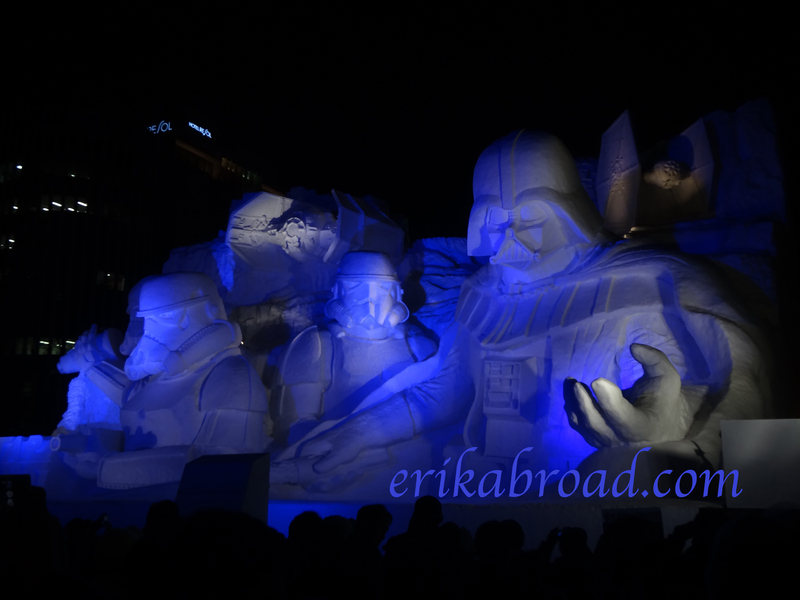 We continued down the street and words could not describe how cool the Star Wars display looked in the midst of its light show. With music blaring and lights flashing to a synchronized rhythm, this was one of the more memorable moments of the festival for me. 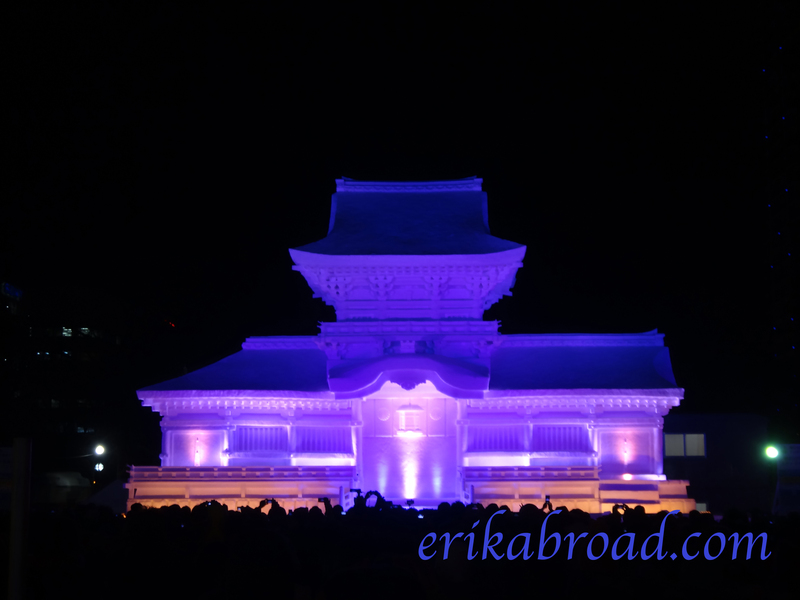 After seeing these magnificent light displays, we continued onward to see the Taiwanese temple yet again before checking out some of the submissions into the international snow sculpture design contest. While Malaysia isn’t exactly known for its show, they even had a team there! I took a photo of their sculpture following an interesting chat with the person in charge of the design and carving. 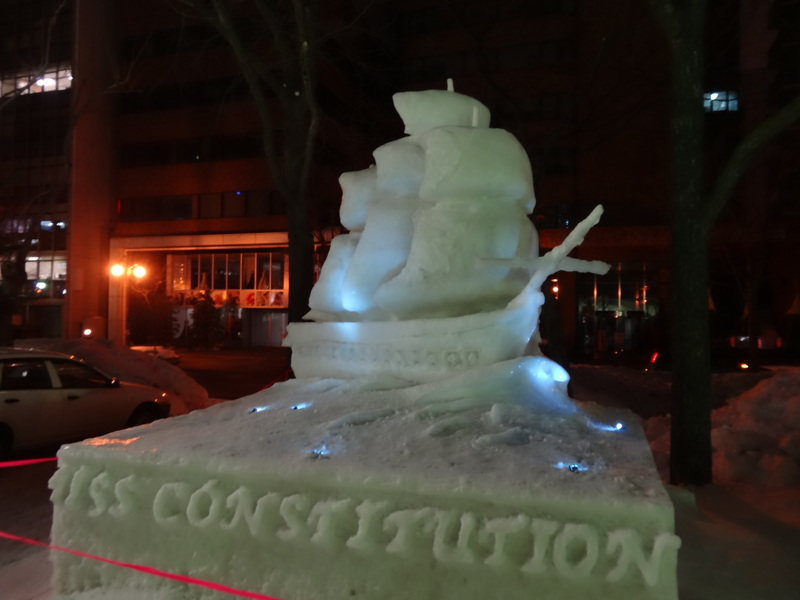 Even the USS Constitution was here! This was my favorite small-scale sculpture at the whole festival, for obvious reasons. 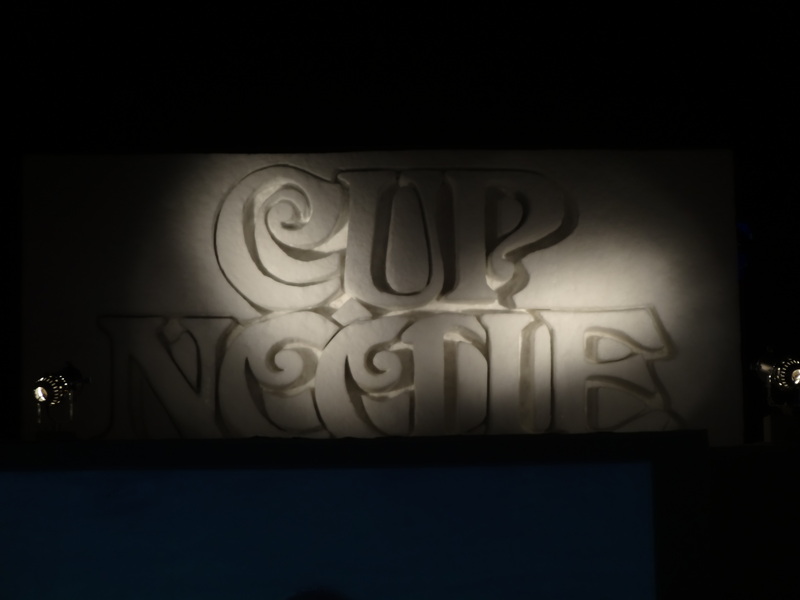 Even Cup Noodles had a sculpture at this festival! 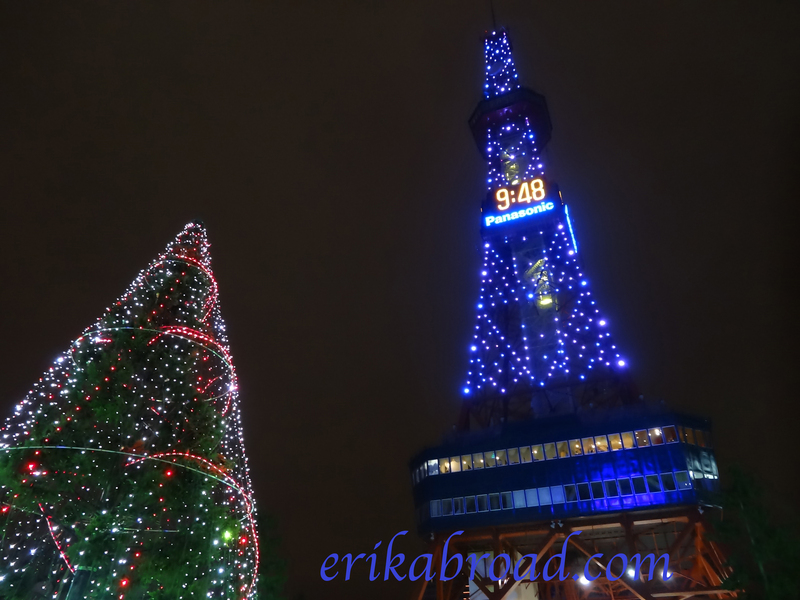 As we continued tripping, slipping, and nearly falling back toward our hotel, we decided to change course and go to the Sapporo TV tower to get the best view of the whole festival– from the tower’s observation deck. 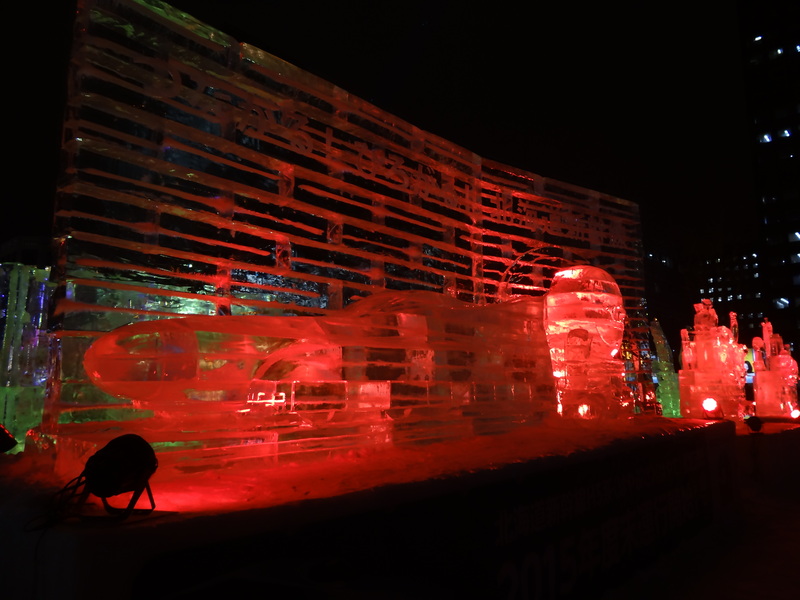 On the way there, we saw some of our favorite ice sculptures from the day turned into true masterpieces at night. The royal couple, an eagle, and the Shinkansen were a few of many. 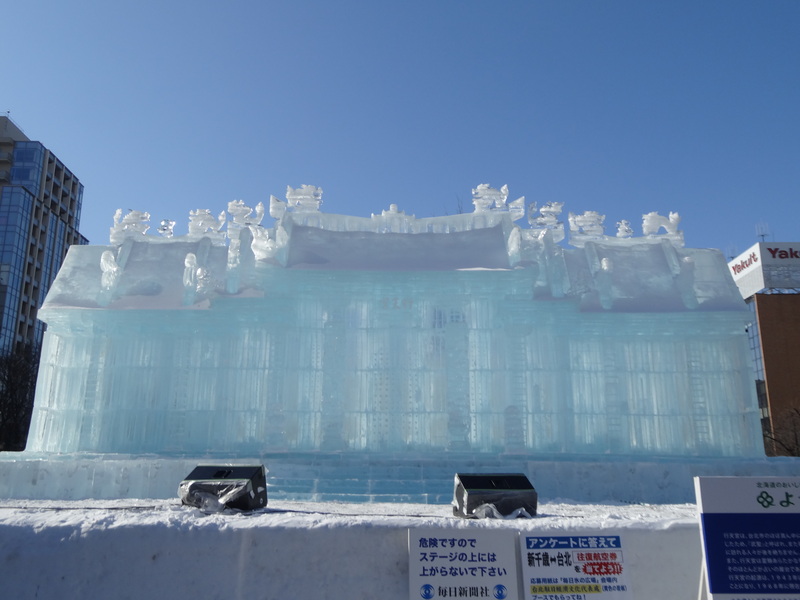 The ice sculptures, much like the snow sculptures, looked much better at night than they did during the day. Our final view of the night was the most breathtaking of all. 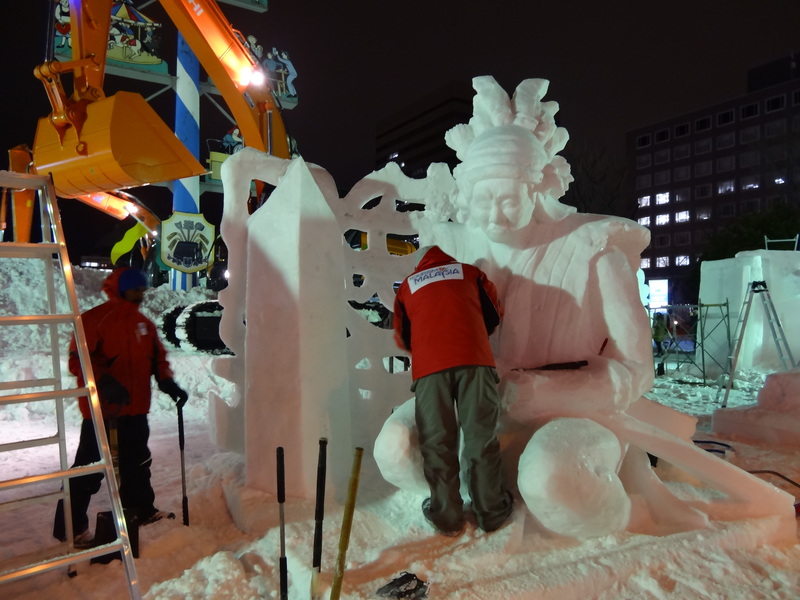 As someone living and working in Japan, I constantly heard suggestions about traveling to Sapporo to see the snow festival over the course of the past two years. While I will admit that it was not high on my list when I first arrived in Japan in July, 2013, I crust say that I am very happy that I cam dot see it this year. 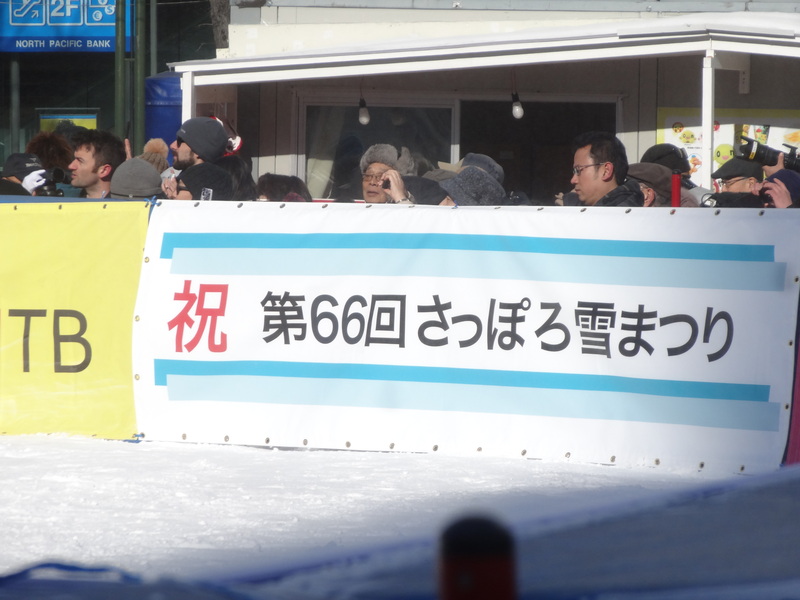 The sheer number of tourists in Sapporo help give the festival a unique vibe. Couple that with the never-ending array of delicious Japanese street food and the beautiful snow and ice artwork and all the ingredients for a memorable weekend were in place. 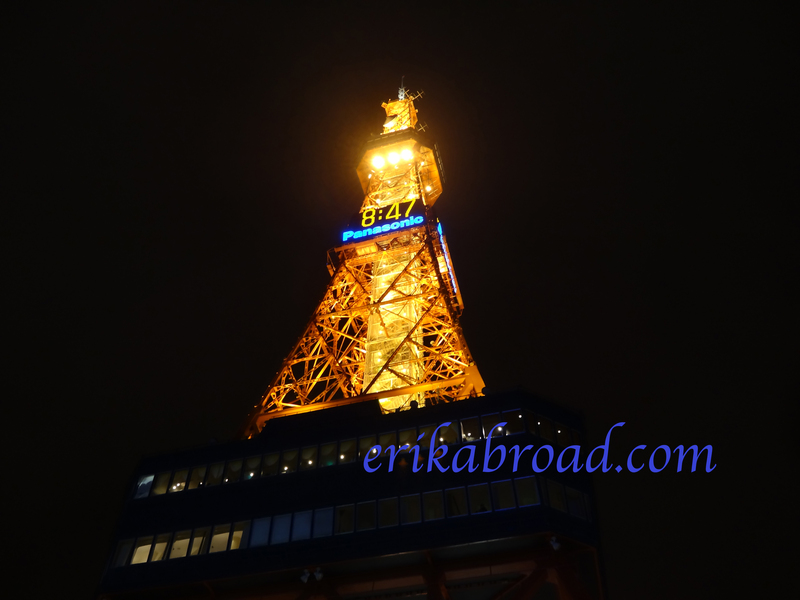 Things would get even more interesting the next day as my friend and I headed to the famous Sapporo brewery and to a few other places around town. More content coming soon. Please share this with your friends! 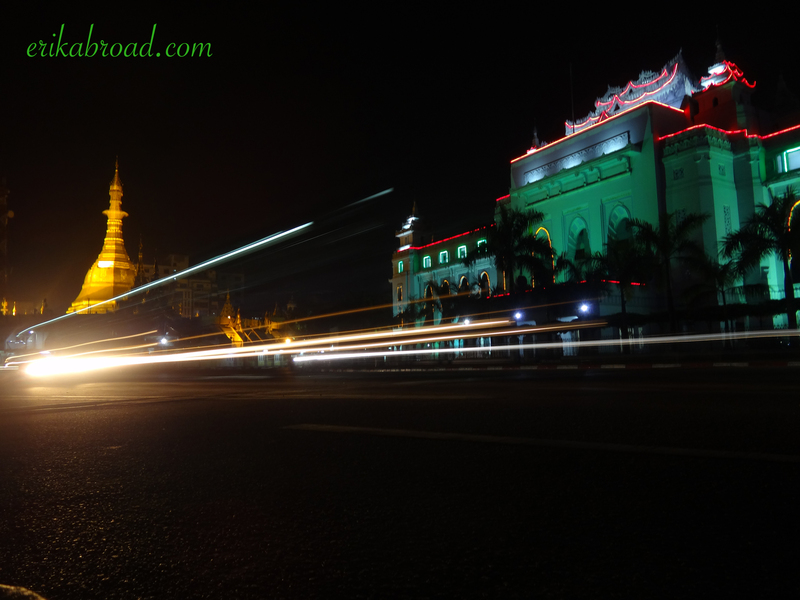 Lights Dominate the Night in Burma on Christmas Eve, 2014. Amazing view. 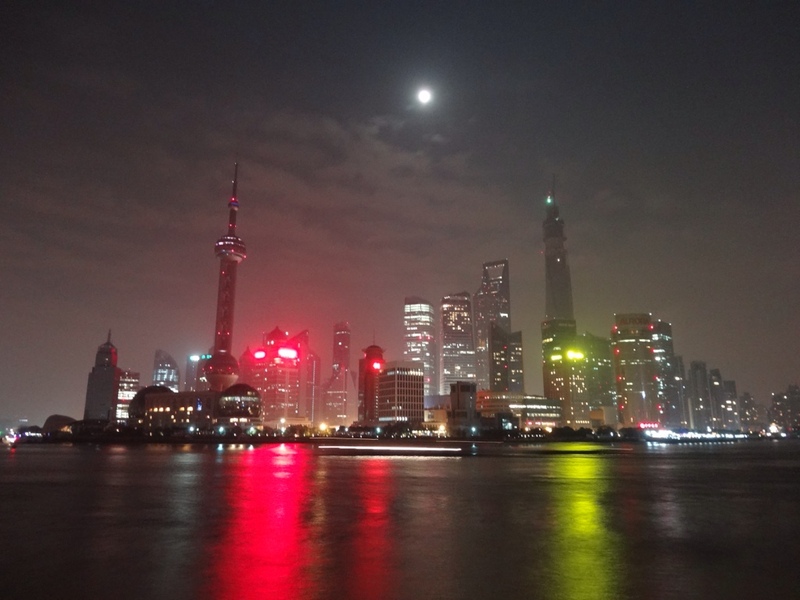 Shanghai last night as seen from The Bund. Certain places are always at the top of the list when it comes to travel and visiting Japan. Kyoto, Tokyo, Hokkaido, Okinawa, Osaka, and a few others are always mentioned as unique places to go or places to go during different times of the year to take in festivals or local cuisine. 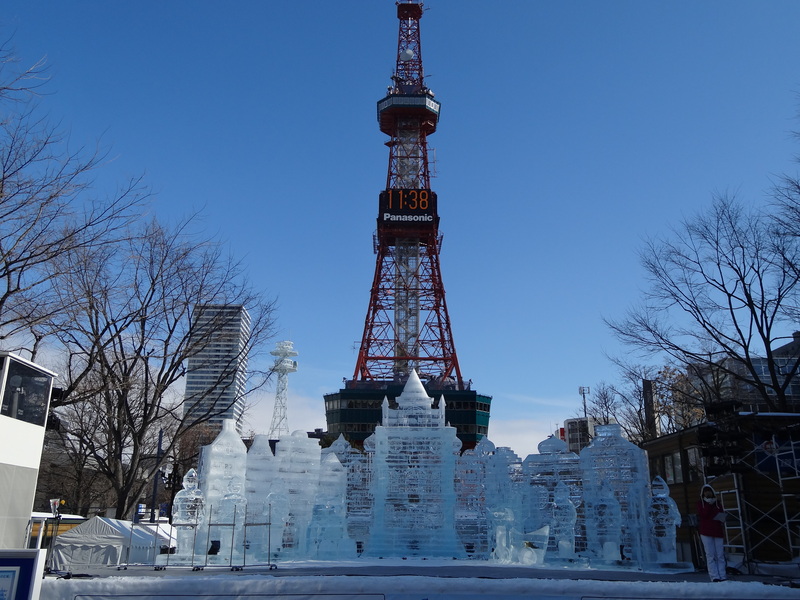 One town, Kobe, must be on you “to visit” list if you come to Japan in the winter. 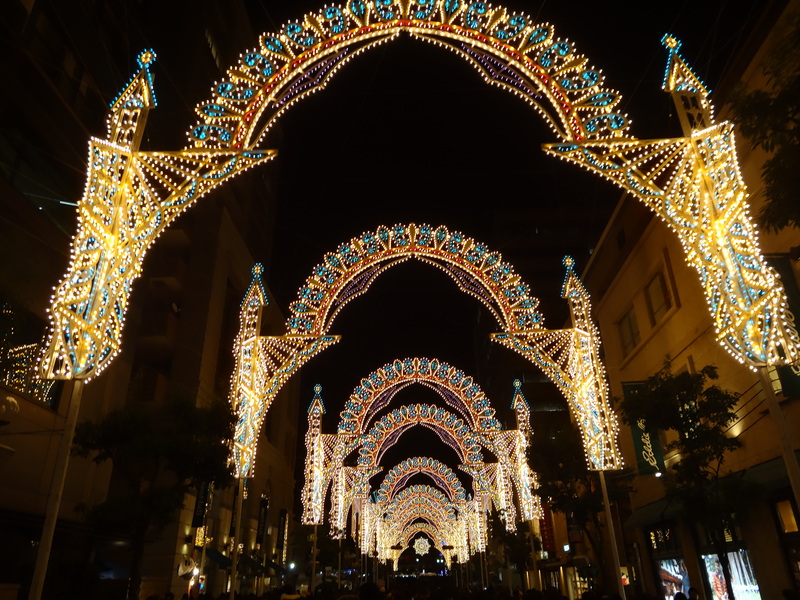 It is a beautiful place with such a unique history of interactions with the West, different architecture, and some historical gems, but one thing sets it apart from the rest of Kansai: the Kobe Luminarie. 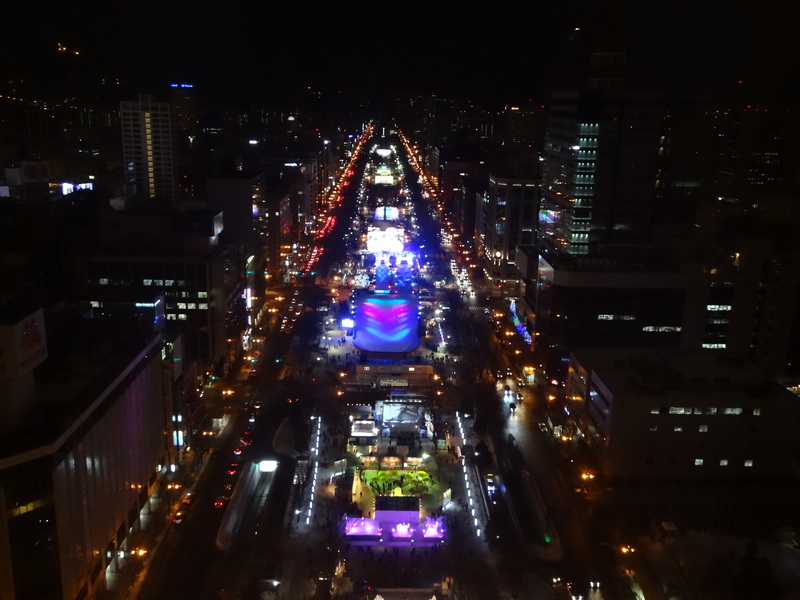 Last evening, I joined two old friends from Philadelphia and headed down to see the Kobe Luminarie, located in the central district of the port city. From the beginning, it was evident that the event would be a sight to behold for all. This was my first time to the Luminarie. It was even the first time for my friend that lived in Kobe several years ago. We were so excited for the event and the brisk cold could not dampen our expectations. Traffic was stopped in many different places in the city to make way for pedestrians heading waiting to see the Luminarie. Even the path heading to the Luminarie itself was lit with grandeur. I was a little homesick at this point, as the main street in my hometown lights its trees in a similar fashion. After a few more minutes of walking, we turned a corner, and off in the distance we could see the front gate to the Luminarie. It was truly remarkable! The twinkling lights, the bright colors, and the gasps and gawking of other visitors was very memorable. I stopped to take a few photos, as well. Here’s the first glimpse of the gate. As we neared the street shrouded in lights, even more interesting things came to light. Western-inspired Latin music plated through speakers, helping lead the tour of the Luminarie. The meaning and importance of both the Luminarie and music goes much deeper than the casual observer would know. Following the Kobe Earthquake of 1995, the Luminarie was established as a memorial of those that lost their lives in the devastating earthquake. The musical scores all centered around the theme of “light” and “continuation” towards a better and brighter future. The luminarie and music had quite the harmonious relationship as you approached the first segment of the Luminarie. After taking a few more photos, we entered the first segment of the Italian-built Luminarie. 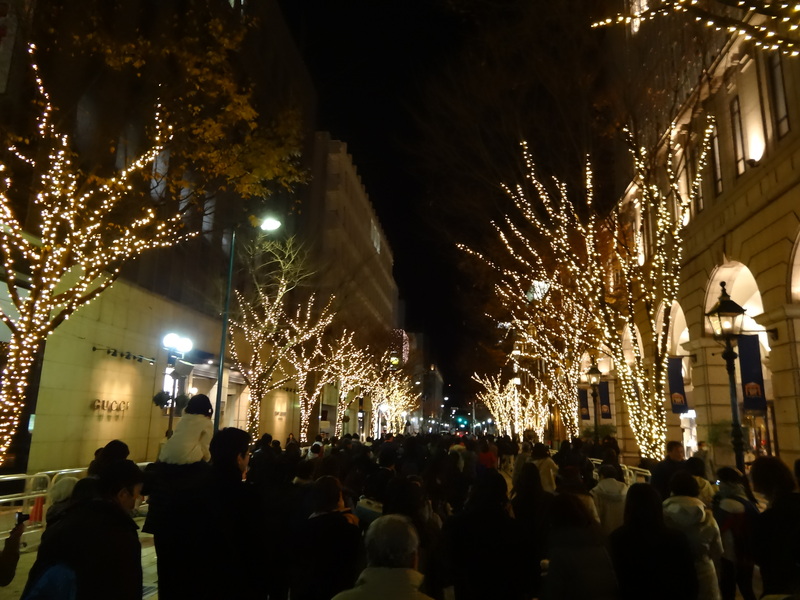 The lights lined the street for several hundred yards and helped create a unique scene in an urban center like Kobe. I certainly did not feel like I was in Japan during this whole adventure. All the while, one of the friend with me on this adventure told me that one of his family members was singing in the musical group which sang the official songs for the event! After traversing the twinkling walkway, we made our way to what can only be described as a beautiful cathedral of light and sound. 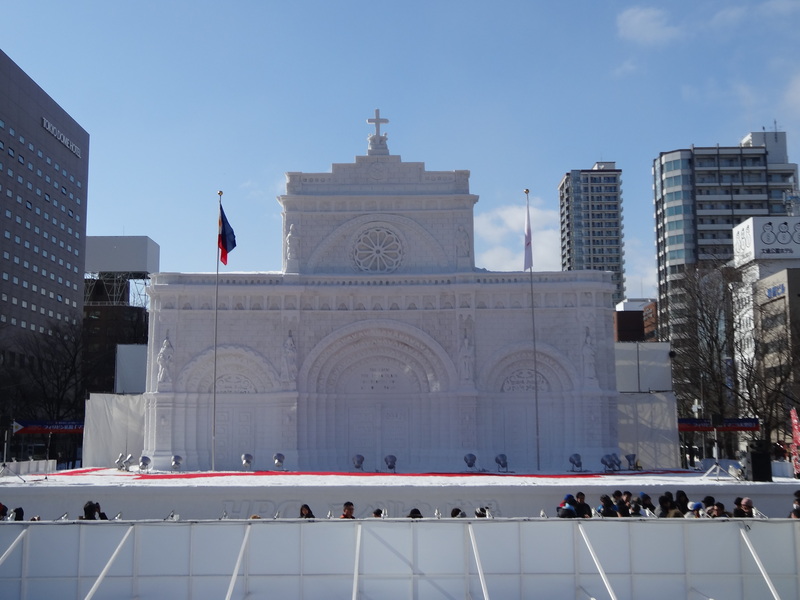 The next structure in the Luminarie appeared, to me, as a church-like memorial and work of art. European-inspired classical Latin music played in the vicinity and I felt like I was back in the streets of Montreal or Quebec City. Many fellow visitors had a similar sense of admiration when we approached the second component of the Luminarie structure. I have included a few photos of my favorite part of the Luminarie. 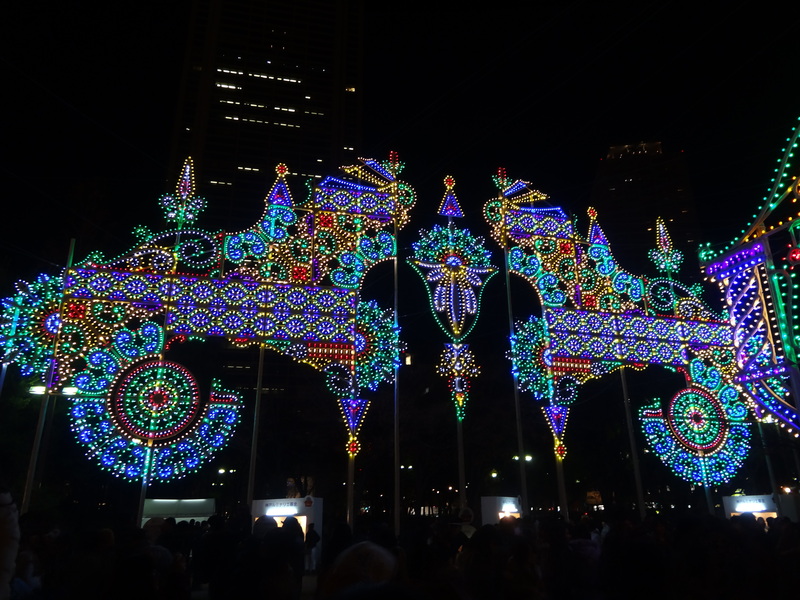 As more elegant music played and the smells of fresh yakitori filled the air, we passed by the final exhibition in the Kobe Luminarie, a much more colorful and modern-looking work of art. 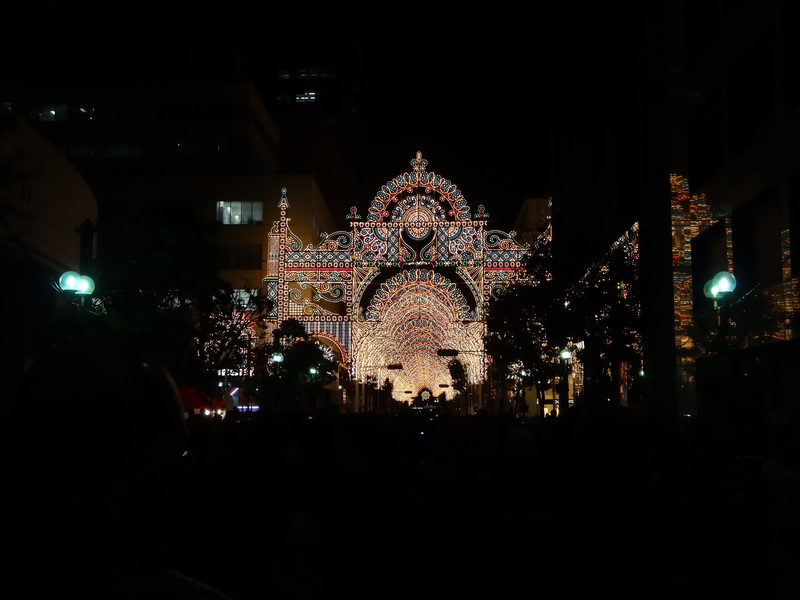 Other places in Kansai have Luminaries and light shows, but none can compare to the display in Kobe. 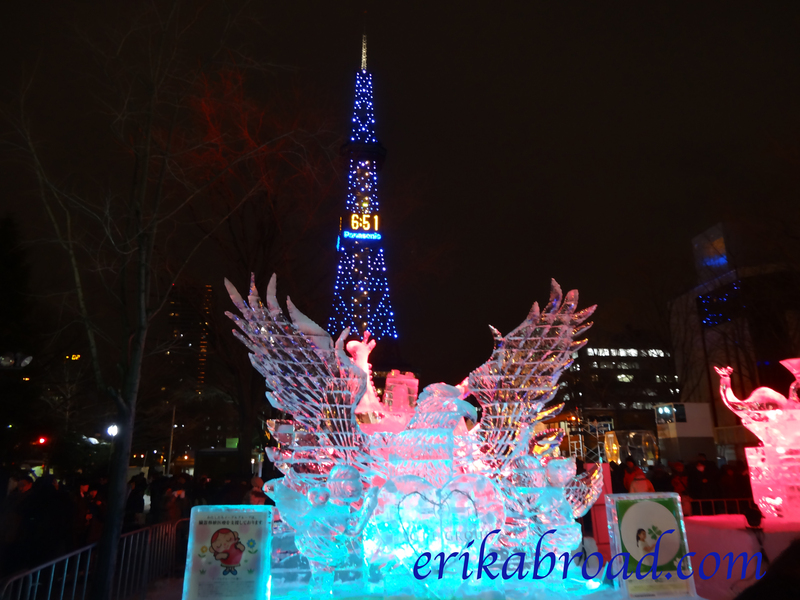 The meaning and importance of the Luminarie coupled with its meticulous setup and musical integration make it an absolute must-see for those of you who may be in Japan next winter, before Christmas. Sharing this moment with two of my friends also helps make it memorable for me. 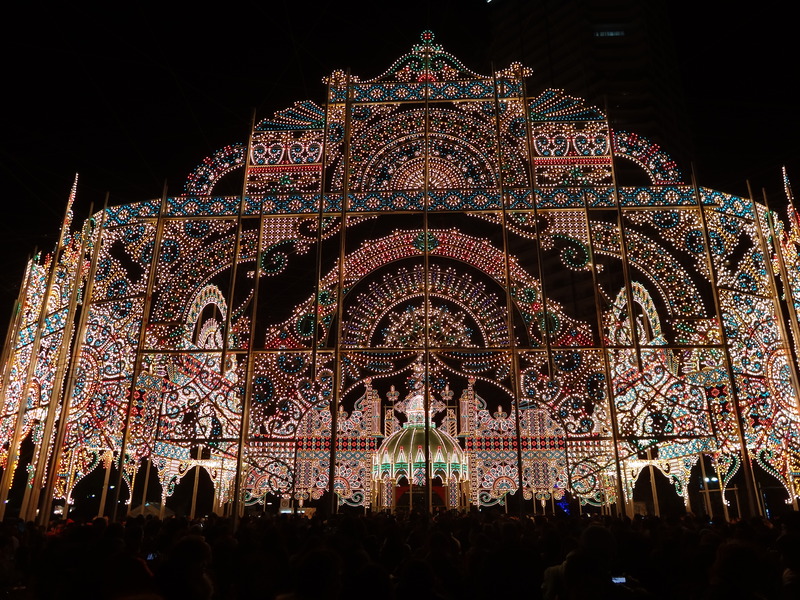 The Kobe Luminarie is truly a pearl on the necklace of Western Japan. When I visited Hong Kong earlier this month, I had a lifetime of expectations and anticipation about the city. I never thought these expectations could be met. Not only were these expectations and travel visions met, they were far and away exceeded by the time the first of three days in the region was completed. 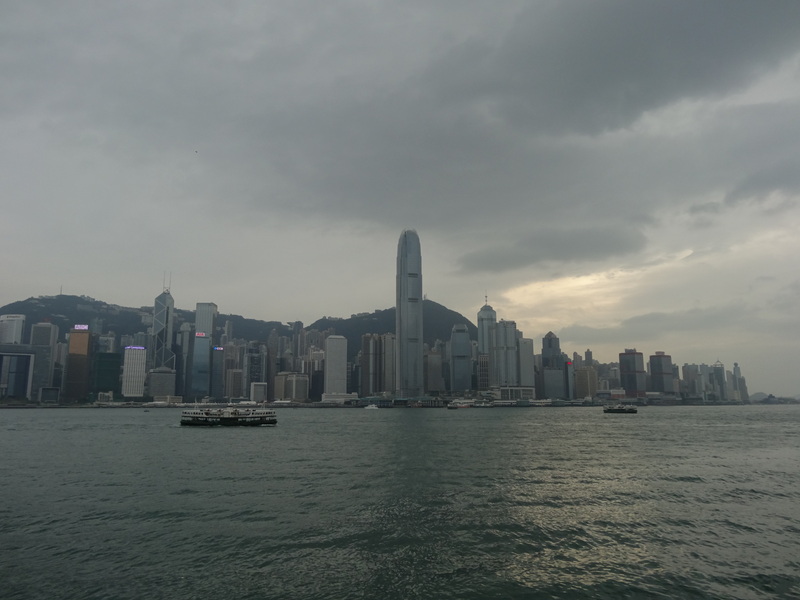 Here’s a look into day two in Hong Kong and why the full day in Hong Kong and Kowloon was so enjoyable and different than our first day/evening on Hong Kong Island. Following our late return from Macau on the last train the previous evening, my friend and I agreed that we would sleep in for our third day in Hong Kong. We wanted to be fresh and well rested for what would be a grueling day on foot throughout the Asian metropolis. After waking up at around 10:00 and enjoying some quality breakfast, we were off and on our way to Admiralty Station to begin our day on the northern part of Hong Kong Island. 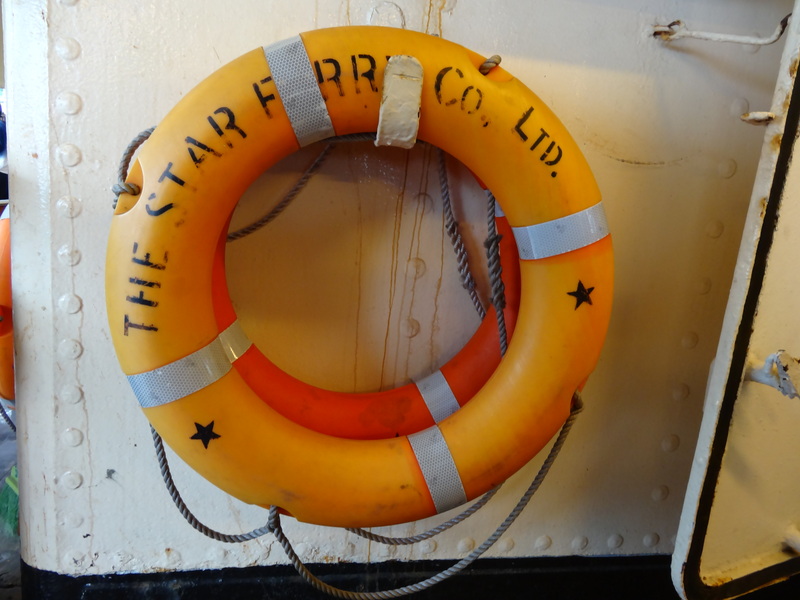 At the station, one holdover of British rule hit us right in the face. 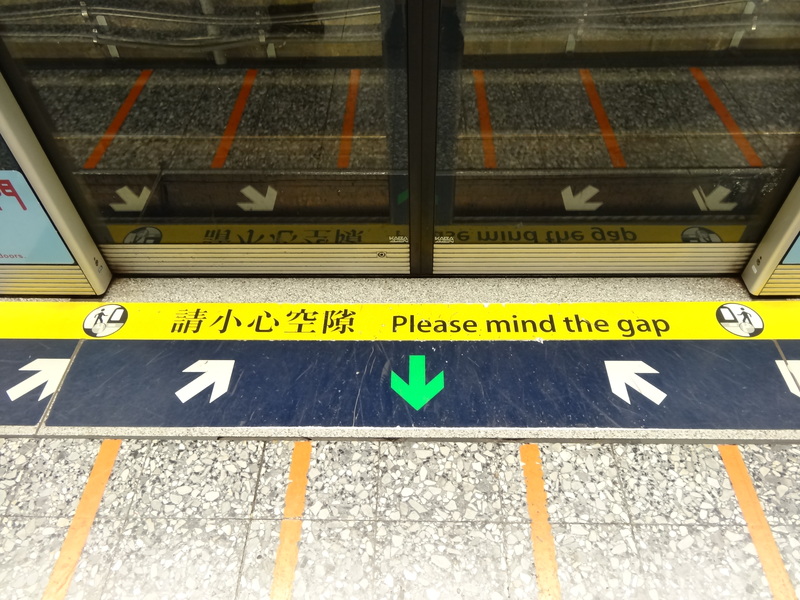 We had to “mind the gap” as we entered the subway car. 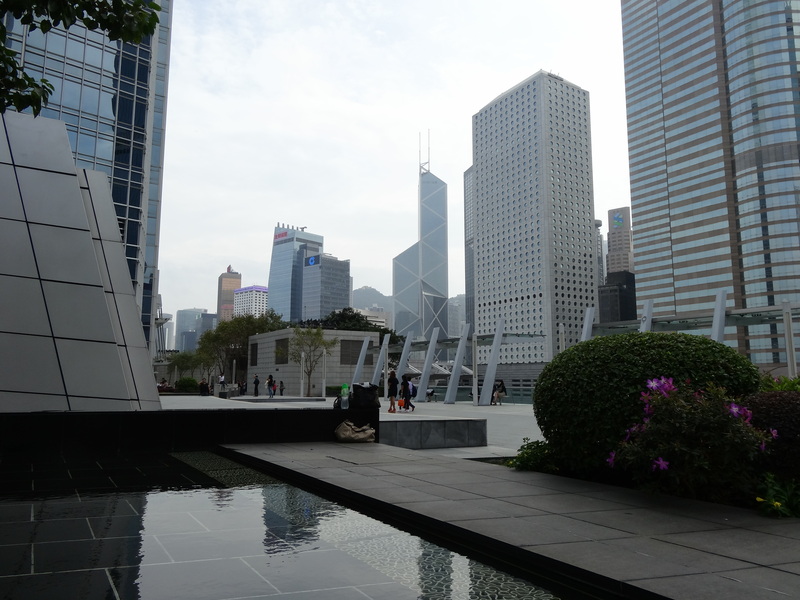 Following the advice of one of my seasoned traveller friends, our first stop of the day was the IFC Mall, located right on the Hong Kong Island side of Victoria Harbor. On the roof of the mall, there is a nice park that provides stunning views of the Hong Kong skyline, Victoria Harbor, and Kowloon. Even better than that, the IFC roof allows individuals to bring food and drinks to the top. We took advantage of the supermarket inside the mall and took up some refreshments and snacks to enjoy a few minutes overlooking Hong Kong to get a different perspective than we had at Victoria Peak the previous evening. It was a great view and great late morning activity. 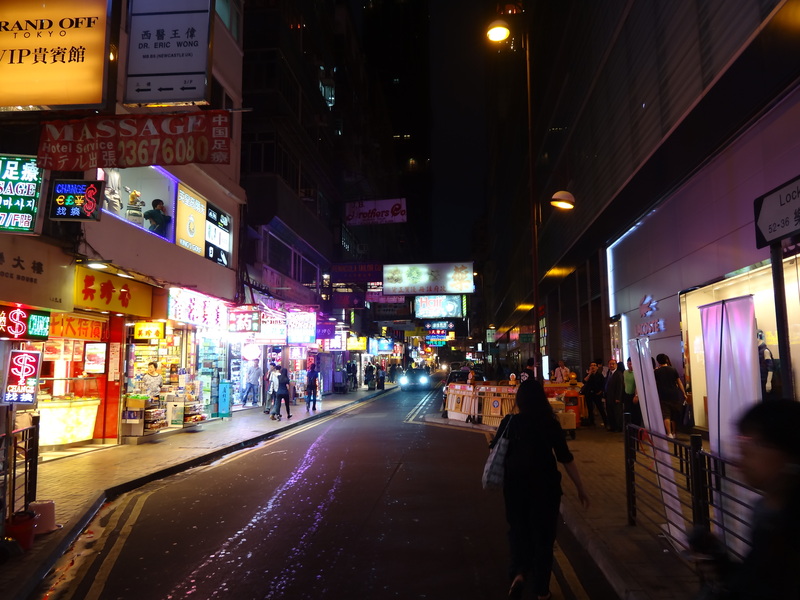 After a while enjoying some drinks and snacks, we passed the entrance to Hong Kong Station and continued, on foot, through Hong Kong Island to make our way to one of Hong Kong’s most famous noodle shops, Tsim Chai Kee. Along the way on Hong Kong’s long, steep, and interesting streets, I could not stop thinking about how much some of these streets resembled a cross between New York and San Francisco. The architecture and layout were certainly different than any other city I’ve seen in Asia to this point. Given that my friend and I live in Japan, we are more than accustomed to having delicious ramen and noodles almost whenever we want it. True ramen and home cooked noodles are some of the most delicious Japanese and Asian foods and I enjoy getting them whenever I get the chance. 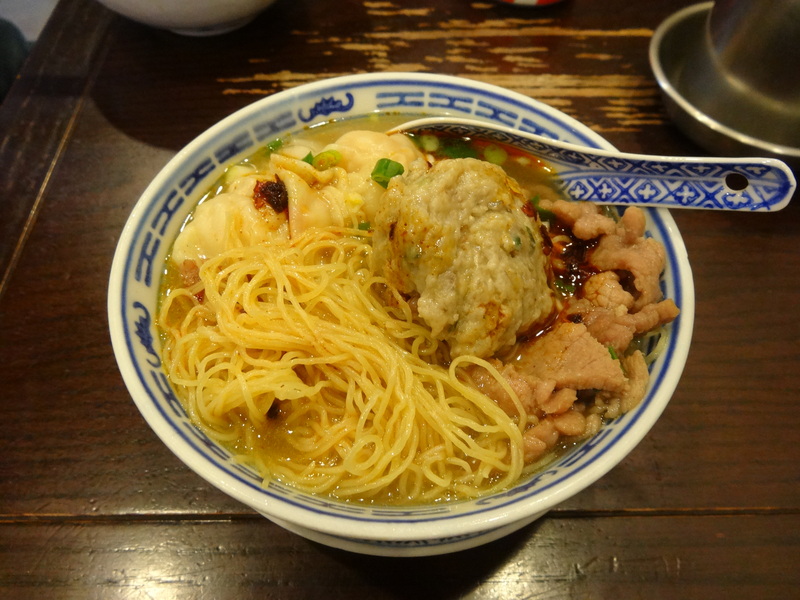 From Seoul and Tokyo to Hiroshima and Kobe, I have had more than my fair share of delicious noodles. 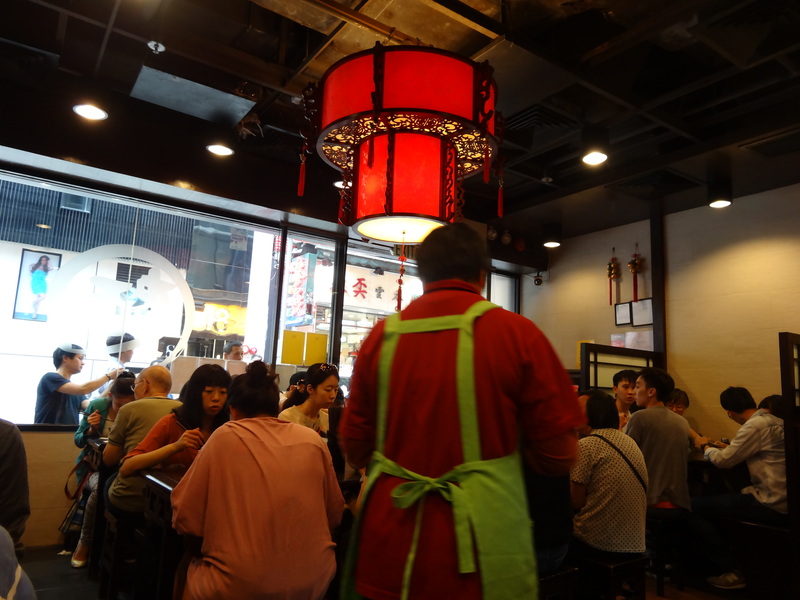 When we read reviews about Tsim Chai Kee online, we knew we had to go to see what all the rage was. As soon as we arrived, we knew we would be in for a treat. Tsim Chai Kee and another Japanese-style ramen shop were the only wo shops on the whole street that had lines of patrons waiting to get in to enjoy lunch. More than that, this place was definitely not a chain restaurant. It was a family run institution. I ordered the noodle bowl which offered a smattering of all the meats the store had to offer and was not disappointed. The purely family restaurant feel of sitting with strangers at the table and the ambiance of hustle and bustle inside the store made for a great atmosphere. The food was even better. Once the steaming hot noodles and cans of Coca-Cola made it to the table, we knew we were in for a treat. The spicy and homemade flavor of the noodles was amazing! It looked pretty good, too. 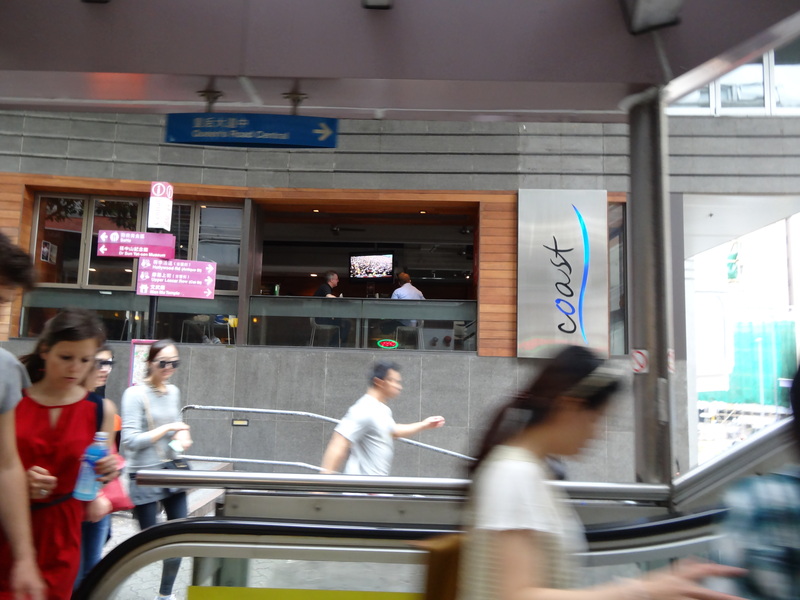 From Tsim Chai Kee, we were off to another Hong Kong institution, the Central-Mid-Levels Escalator. 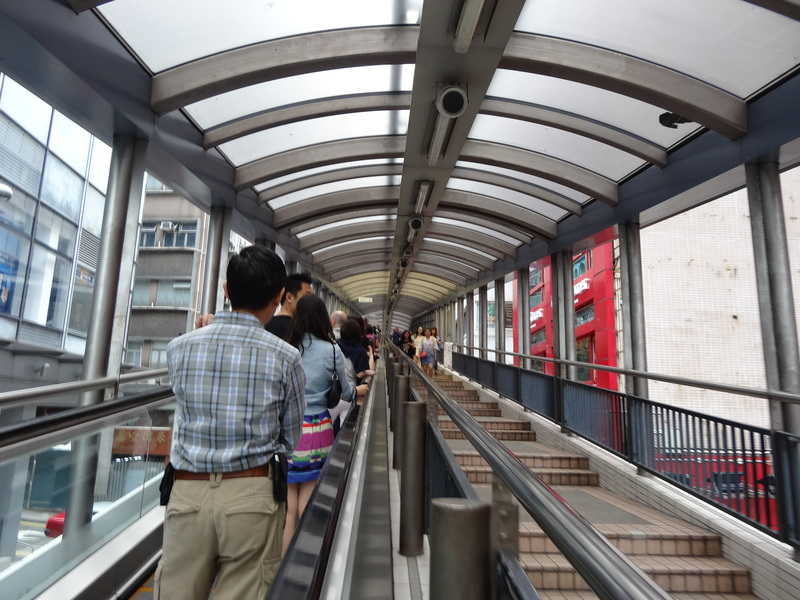 While researching Hong Kong, I had read quite a bit about this escalator and walkway system which traversed through the heart of Hong Kong Island. For full disclosure, we had completely forgotten about this stop on our trip until we saw it out of the corner of our eye while we were on the way to Tsim Chai Kee Noodle. 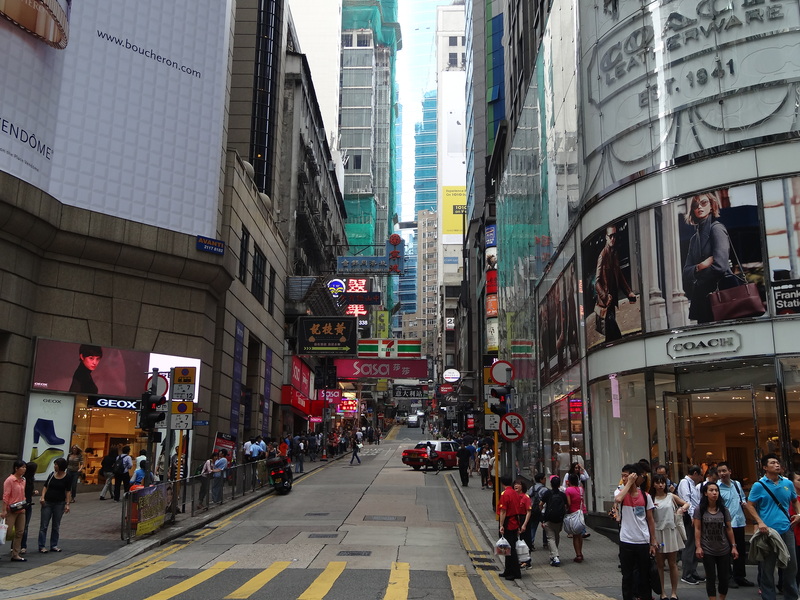 We reshuffled some of our plans and made time to take the entire escalator route through Hong Kong. I won’t soon forget the experience of riding an elevated escalator through one of the world’s biggest cities. As we climbed through the city, we passed by all kinds of shops, stores, construction, and streets to our right and left. There were entrance and exit staircases and escalators on both sides of the route so it almost felt like we were riding on a highway back in the United States, except this highway was one big escalator. The bars, restaurants, and stores were all teem ping with life as people hopped on and off the escalator. 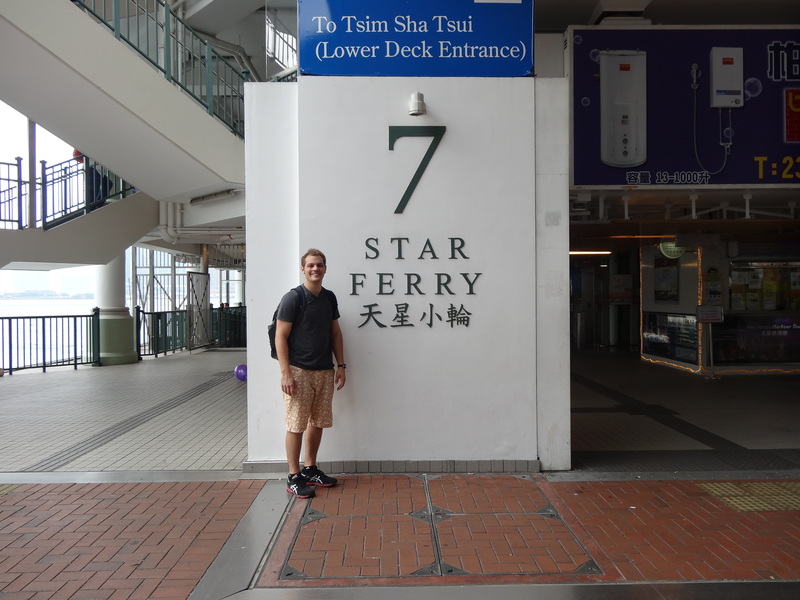 Once we reached the end of the escalator ride, my friend and I agreed to stake a taxi back to Victoria Harbor to take a ride on another one of Hong Kong’s most famous attractions, the Star Ferry. 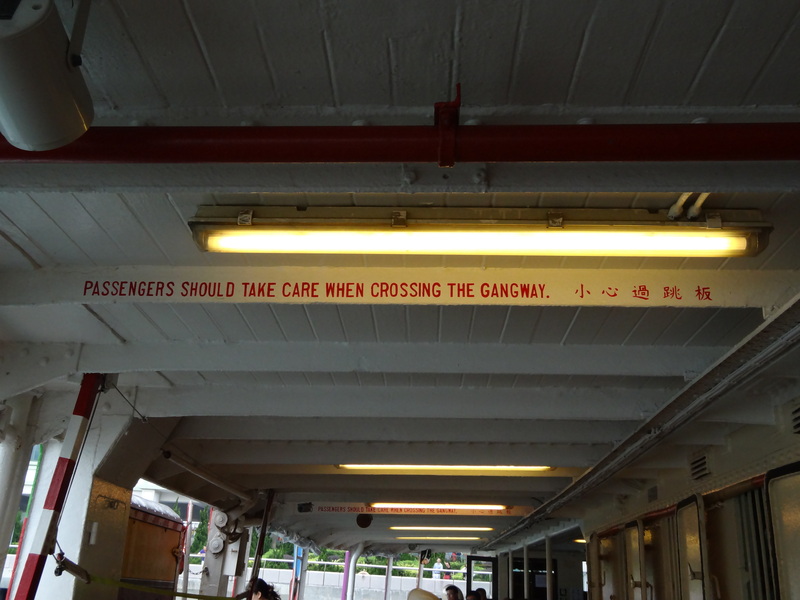 As one of the world’s oldest and the world’s most busiest ferries, you have to ride if when you go to Hong Kong. Given the price (less than 50 cents, USD), skip the subway ride from Hong Kong to Kowloon and take a ride across the Harbor. I won’t forget the view from the boat as we passed through Victoria Harbor. CI also got to cross off one more thing from my travel bucket list in the process. 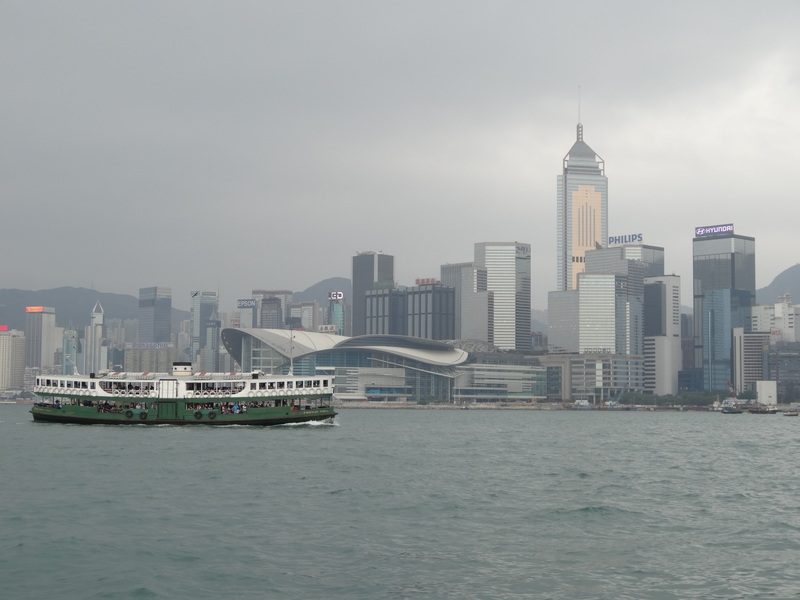 As the photographs show, the ride across the harbor provides some spectacular views of the skyline and other ferries. I finally was able to capture that photo I saw many years ago, hung on the wall of the Chinese restaurant in my hometown. It was as breathtaking as I thought it would be. After disembarking the ferry, my friend and I headed to the harbor for one final look at Hong Kong Island from the famous Clock Tower. The view was remarkable. The high buildings contrasted with the harbor and passing boats made a great scene where we just sat and watched passing boats for about thirty minutes. Even the sun burst through for a brief period of time. From there, we stumbled into another ritzy and unforgettable shopping center much like the one I mentioned in my previous postings. All the name brand designers and watch makers were there. This one, however, had a unique twist: there was a park and green space on the roof near one of the entrances. 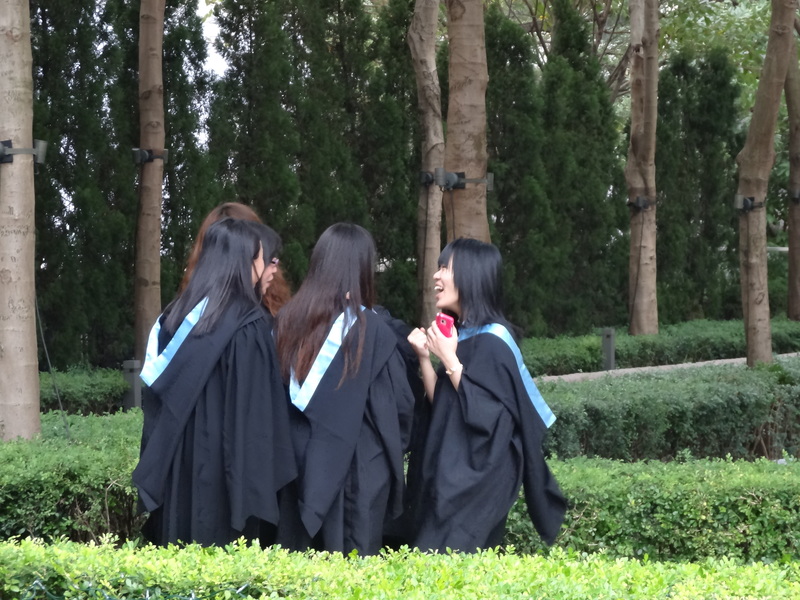 A high school graduation ceremony was taking place and I was fortunate to capture a moment of pure joy as some girls remarked on their time as students together. Following some more street food and some browsing in the shopping centers, we made our way tom more Hong Kong Landmarks as our stay began to wind down to its conclusion. 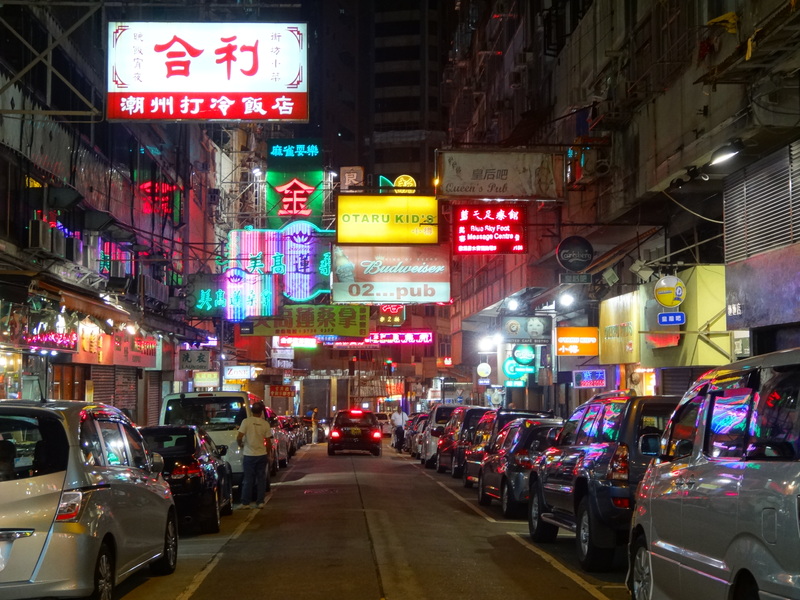 We returned to Jordan Street to see the famous Hong Kong Night Market, browse some more of the local shopping stores and take in one of Hong Kong’s most famous images: neon signs overhanging the streets. We were not disappointed, and I was able to pick up a Hong Kong t-shirt for all of $2.50 US. It was a great way to wrap up an unforgettable trip. When I look back on the trip to Hong Kong, I will never forget the nighttime scenery, the views from Victoria Harbor, or spending time with one of my new friends at another relocation in Asia. Very rarely do travel destinations live up to all of our expectations and then surpass all. Hong Kong certainly did that for me. I will be back in less than three weeks as Hong Kong is the starting and ending point for a forthcoming trip which will be more grueling and three times as long as the four day trip to Hong Kong earlier this month. I look forward to bringing you along with me on another Asian adventure. I just hope the next one is as enjoyable as this one was. I took this photo on Sunday evening at the famed Kiyomizu Temple in Kyoto, Japan, with my point and shoot camera and a 100 円 tripod from Daiso (a cheap store in Japan). The temple, it surroundings, and changing leaves are often lit in the evenings during this time of year. This memorable photo proves a point and shoot can do just as well as any other camera. Please enjoy the beauty and share with your friends. 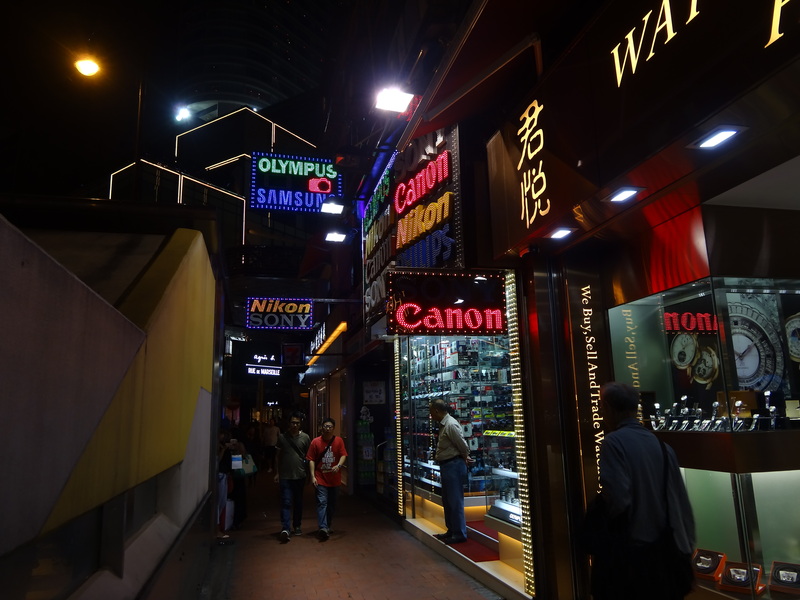 I have returned from Hong Kong and will have extensive posts about my time in Hong Kong and Macau in the coming days, but needed to share this photo of the famed Nathan Street before I go to bed and prepare for work tomorrow. 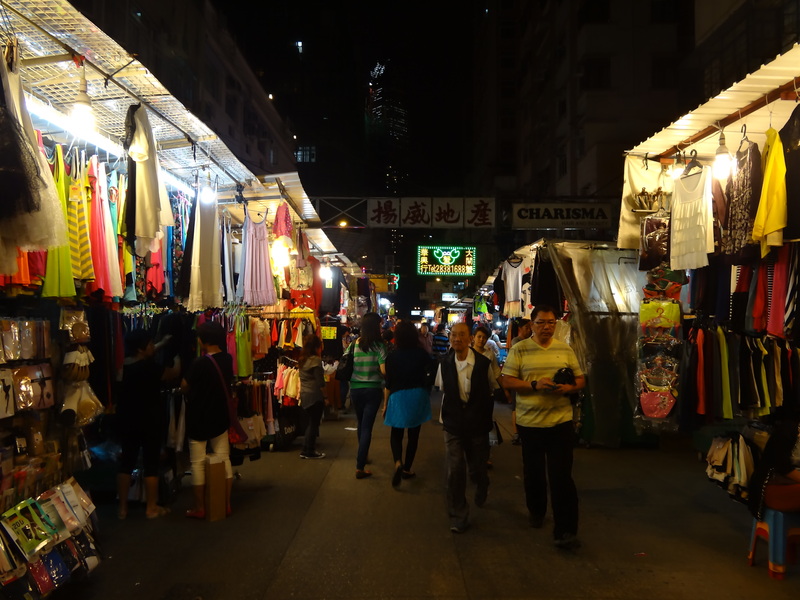 I loved everything about Hong Kong from the glitz and glamor in the shopping districts to the street food and the Star Ferry, but taking in the local sounds was also amazing. Take a moment and be taken into the heart of Hong Kong. 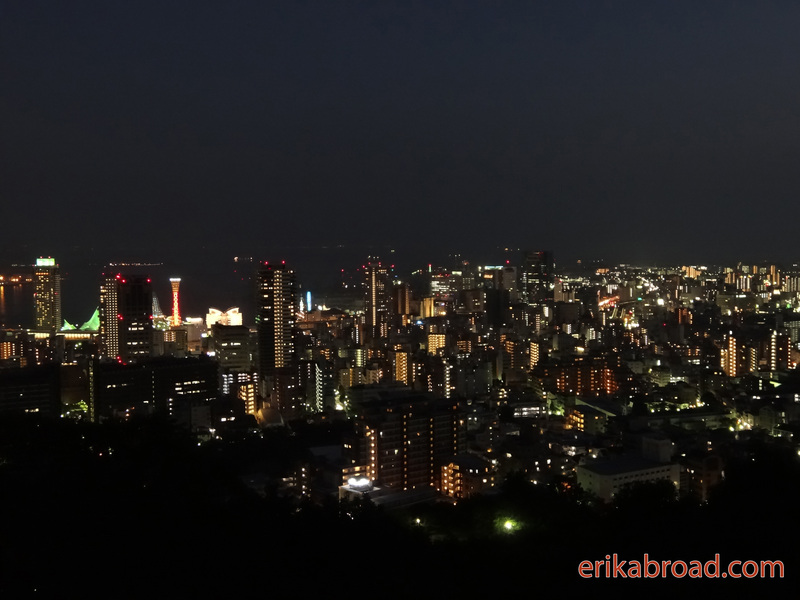 Last evening, a friend and I decided to head to the famous Rainbow Bridge in Kobe, Japan, to see what city looks like from the mountain ridge north of the city. What we encountered was truly breathtaking, but the journey to get there was just as eventful. Walking from Sannomiya Station, we traversed through back alleys filled with small mopeds, motorcycles, children, and shops on the way to the top of the mountain. On our way, we passed a mosque, several shinto shrines and temples, and some great ramen shops. Whenever I think of Japan, it is these scenes that come to mind first. I always find it amazing how there is such a convergence of old and new in Japan. Here is how Kobe looked last night. It was beautiful. I still cannot believe I live here.